Enhanced growth and marketability – Students will be able to grow their knowledge of ethical leadership principles, and use this knowledge as a platform to communicate this interest to potential employers. Immediate application of Learning – Students will engage in training sessions with speakers, who will help them better understand how to uphold their values on campus and in the workplace. Increased Opportunities – Students will have opportunities to interact with ethical leaders and enhance their strategic networking skills. Leading Leaders – Students will have the opportunity to interact with other student leaders from across the country and work collaboratively to enhance each others’ learning experiences. Financial Growth – Students will be able to generate funds for themselves or their chapters through ethics competitions. Provide educational meetings and activities to enhance students’ understanding of business ethics. 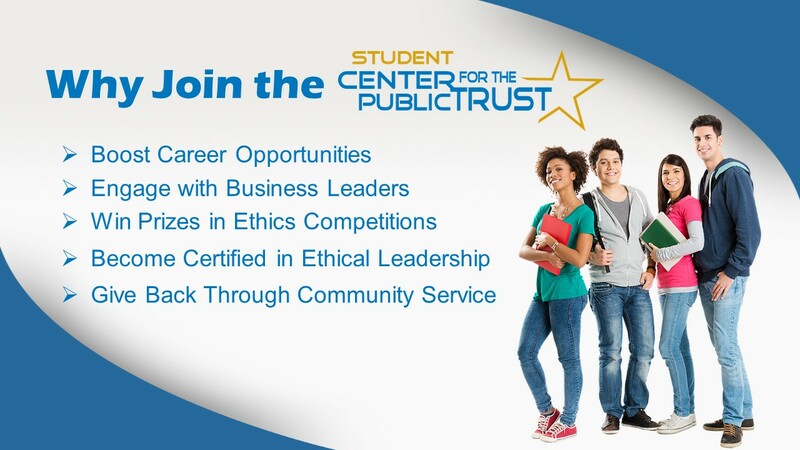 Help students understand how to apply ethical business practices and leadership principles to their lives. Provide students with resources to host events that support their development as ethical leaders. Connect students with business professionals and other student leaders.